Ma and Pa Glutie Foodie recently came to town for a visit. At the end of a hectic weekend filled with lots of indulgent eating and exhausting activities, Ma and Pa, Sister Seitan and I were all in the mood for something low key, light and healthy. Sushi sounded perfect and I knew just the place. 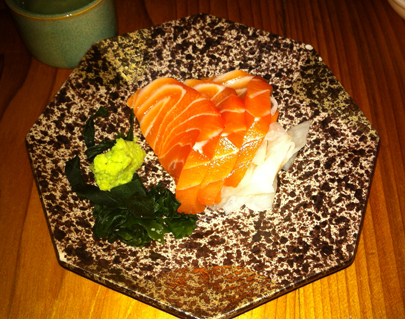 Washington DC has Sushiko to thank for leading the bandwagon of authentic Japanese cuisine in the District. The restaurant opened its Georgetown doors in 1975 and expanded in 2008 to a second location in Chevy Chase, MD. In a city of mediocre Americanized sushi and Asian Fusion confusion, Sushiko’s traditional simplicity and reliable quality is refreshing. Their mission is to honor Japanese culinary techniques, using care and precision in the preparation of exemplary food. Despite Japanese cuisine’s minimalist characteristics, it is often a challenge for gluten-free diners to enjoy sushi worry-free. Between wheat-based components like soy sauce and tempura, and language barriers, gluten-free awareness can vary greatly between restaurants. Thus, I was thrilled to learn that Sushiko is once again ahead of the game with a gluten-free menu that includes dozens of tempting options. To start, Sushiko offers a couple of salad options dressed with oil and rice vinegar, a simple accommodation that should be offered at all Japanese establishments (I have no idea why it’s not). Items in the hot dishes category are stripped down to their bare bones, sans sauce. Chicken Teriyaki, Beef Tenderloin Kushi Yaki and Grilled Salmon Miso Yu-an are simply cooked with salt and pepper, healthy yet uninspiring. While I appreciate every effort made, I urge Sushiko to go one step further. Gluten-free tamari sauce is readily available to accompany the sushi; why not try cooking up a sauce with the tamari to dress up the hot dishes. If you’re in the mood for more zest, the maki section of the menu offers a nice variety of options. For safety purposes in other Japanese restaurants, I typically stick to basic rolls comprised of some combination of salmon, tuna, yellowtail avocado and cucumber. While delicious, it gets boring! Luckily Sushiko provides some color. 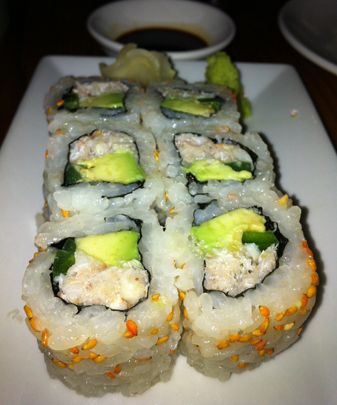 I was thrilled to see a Spicy Tuna roll listed, something I always avoid due to ambiguous spicy sauce recipes. Other exciting options include Rock Shrimp Cilantro maki with jalapeno and mayo, and the Soft Shell Crab maki, with gluten-free flour for the tempura. 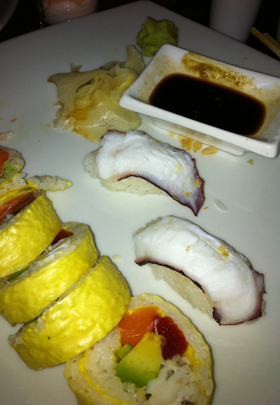 Overall, Sushiko provides a stress-free environment to enjoy top grade raw fish and all the fixings. While the menu leaves room for improvement regarding gluten-free preparations, it aims to please more than just the g-free among us. 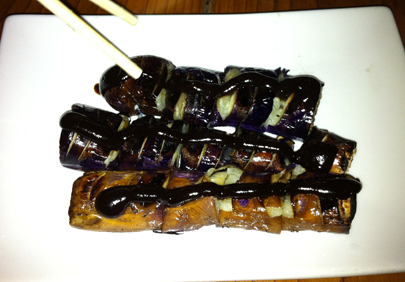 Sister Seitan’s vegetarian palette was quite content, and Pa Glutie Foodie’s aversion to sushi proved inconsequential. But what pleased Pa the most were the reasonable prices, a relief after a long weekend of treating his girls. 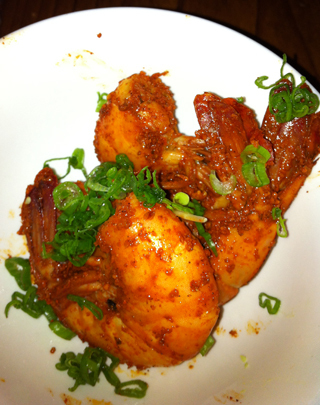 Categories: 3 Spoons, Asian, Gluten-Free, Japanese, Maryland, Sushi, Washington DC | Permalink. I understand that fusion food is trendy. But mole and soy are two sauces I’d rather not mix. In my opinion sake and Tequila belong at very different meals. Chef and restauranteur Richard Sandoval disagrees and tries to prove me wrong at his Latin-Asian creation, Masa 14. Sandoval blends his Mexican roots with international flavor in 26 restaurants throughout the US, Dubai and Qatar. Melding such diverse and broad cultures as Latin and Asian into one cohesive dining concept is not an easy task, and I’m not an easy judge. So on a recent first-time visit to Masa 14 with our friends Bagel and Lox, this Logan Circle staple had a challenge on their hands. Masa 14 plays the atmosphere just right, mixing minimalist feng shui and bamboo surfaces with tequileria red lighting and exposed brick. We arrived without a reservation knowing full well that would mean a long wait. Squeezing out a space along the bar, we settled in and studied the drink list. Whiskey, rum, tequila and sake are all players on this list of inventive concoctions. I opted for a glass of red sangria with bourbon, citrus, brown sugar and cinnamon, a safe and rather delicious way to loosen up my judgmental spirits. Forty-five minutes later Mr. Green Bean, Bagel, Lox, and I were escorted to a cozy booth, and I was promptly handed the gluten-free menu. This was one of those rare times I found myself relieved by the pared down list of small plates after glancing at the jumble of words on the full menu. Lucky for me, the gluten-free options include some table pleasers, putting me in the game for sharing. We started with the spicy edamame for munching and a carafe of sake for sipping. After placing our order, the plates arrived at a leisurely pace, starting with Lox’s top choice, Salmon Tartar (of course), with roasted red pepper and green mango chimichurri. The dish was beautifully presented, with a molded heap of pink salmon and a swipe of green chimichurri on the side. Both elements had a mild flavor, appropriate for the raw fish, but unexpected and disappointing for the chimichurri. Next came the Crunchy Shrimp, sprinkled with sesame, scallions, masago, and a drizzle of chipotle aioli (teriyaki sauce omitted to make it g-free version). The restaurant claims to use a separate fryer to make this plate safe as can be. The dish won Mr. Green Bean over (he still talks about it today). Admittedly, anything with tempura has an unfair advantage. But the rich chipotle aioli adds flare to the perfectly battered shrimps. I did miss the sweet touch that teriyaki sauce would offer, but Crunchy Shrimp is still an unusual treat for those of us who have been deprived of tempura for years. Not worth the buck is the Roasted Beet Salad, with arugula, curried goat cheese, taro straws and oil and vinegar substituted for the soy-citrus vinaigrette. I’m going to guess it’s the dressing that makes this salad, because without it, it was uninspired. What did charm me were the Wok Stir-Fried Mussels with aji amarillo cream sauce, chorizo, cotija cheese and scallions. I had to keep from spooning the spicy broth for fear of nose-dripping, mouth-burning torture. While the flavor of the mussels was completely overwhelmed by the sauce, only a few shells remained closed, an indication of a fresh batch. The manly Boneless Beef Shortrib that appeared next was selected by Mr. Green Bean and Bagel. Surprisingly g-free, I gave it a try. The meat was decent, yet covered with a heavy hand of something far too brown and flavorless to be peanut cocunut-milk sauce. While arriving too late to act as the accompaniment it is, the Fried Rice with kimchi, chile, poached egg, corn, and cilantro was a fresh take on the traditional grain, with Korean spices dominating. We certainly could have stopped there but were collectively tempted by the Salted Caramel Chocolate Flan on the dessert menu. Thrilled to learn it is gluten-free without the crispy wafer (which tastes like paper anyway, so we were told by our server), we had to try it. The flan was perfectly creamy with mild chocolate and caramel flavor, but proved more American pudding than Spanish custard. The marshmallow blob on top and the pool of blood orange reduction on the bottom were unavoidable, rendering the dish too sweet to finish, even four ways. Overall, Sandoval impresses with his colorful and unique menu, while some execution may be lacking, leaving my taste-buds slightly confused. 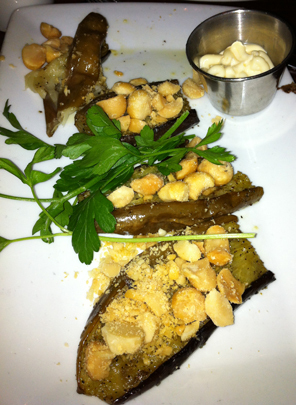 The designated gluten-free menu enables a stress-free dining experience, which makes up for some disappointing dishes. I may be persuaded to return, but likely will stick to edamame and drinks on the establishments best feature, it’s rooftop. Categories: 3 Spoons, Asian, Dessert, Gluten-Free, Latin, Small Plates, Sushi, Washington DC | Tags: richard sandoval | Permalink.